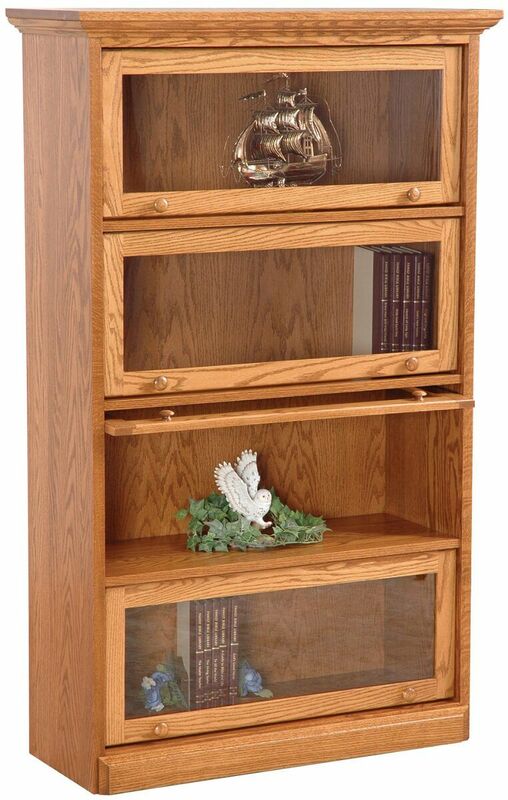 Perfect for displaying books, framed photos, and decor, each shelf on the Advocate's Bookcase boasts mortise-and-tenon joinery and solid wood detail trim. Both traditional and contemporary rooms can benefit from the addition of one of our Advocate's Bookcases. Glass doors framed with solid wood slide up easily and then glide in and out of the way on a wood peg slide. Your barrister bookcase with an attractive crown moulding features Amish handcrafted mortise and tenon joinery ensuring heirloom-quality furniture. One of the attractions of the barrister style Advocate's Bookcase is that the construction helps to provide a greater degree of protection. The glass doors help to limit the amount of dust that can settle on the books, which will help to keep the book collection in better overall shape. If you like the look as shown, select Oak with a Salted Caramel finish. If you'd like to match your new bookcase to your existing home or office decor, browse our wood and finish options to come up with the perfect combination.